Welcome to the Apache UIMA™ project. Our goal is to support a thriving community of users and developers of UIMA frameworks, tools, and annotators, facilitating the analysis of unstructured content such as text, audio and video. UIMA enables applications to be decomposed into components, for example "language identification" => "language specific segmentation" => "sentence boundary detection" => "entity detection (person/place names etc.)". Each component implements interfaces defined by the framework and provides self-describing metadata via XML descriptor files. The framework manages these components and the data flow between them. Components are written in Java or C++; the data that flows between components is designed for efficient mapping between these languages. UIMA additionally provides capabilities to wrap components as network services, and can scale to very large volumes by replicating processing pipelines over a cluster of networked nodes. Apache UIMA is an Apache-licensed open source implementation of the UIMA specification [pdf] [doc] (that specification is, in turn, being developed concurrently by a technical committee within OASIS , a standards organization). We invite and encourage you to participate in both the implementation and specification efforts. all licensed under the Apache license. The dashed-line boxes above are placeholders for possible future additions. The Frameworks run the components, and are available for both Java and C++. The Java Framework supports running both Java and non-Java components (using the C++ framework). The C++ framework, besides supporting annotators written in C/C++, also supports Perl, Python, and TCL annotators. 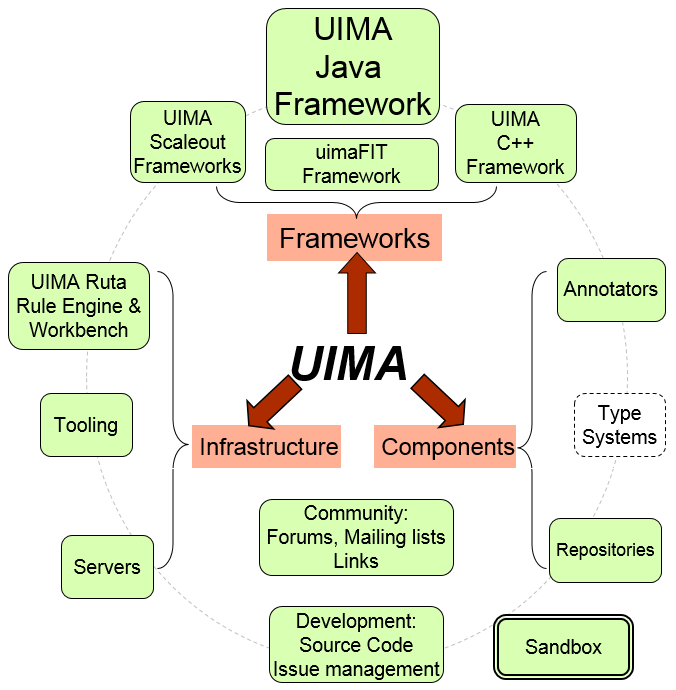 The UIMA-AS and UIMA-DUCC are both Scaleout Frameworks and are addons to the base Java framework. The UIMA-AS supports very flexible scaleout capability based on JMS (Java Messaging Services) and ActiveMQ. The UIMA-DUCC extends UIMA-AS by providing cluster management services to automate the scale-out of UIMA pipelines over computing clusters. Visit the UIMA-DUCC live demo description and the UIMA-DUCC live demo itself. The frameworks support configuring and running pipelines of Annotator components. These components do the actual work of analyzing the unstructured information. Users can write their own annotators, or configure and use pre-existing annotators. Some annotators are available as part of this project; others are contained in various repositories on the internet. Additional infrastructure support components include a simple server that can receive REST requests and return annotation results, for use by other web services. The Addons and Sandbox is for Addons (Annotators and other things) for UIMA, and a place where new ideas are developed for potential incorporation into the project. Apache UIMA, UIMA, the Apache UIMA logo and the Apache Feather logo are trademarks of The Apache Software Foundation.